I am currently swamped with homework assignments and I'm prepping (or at least trying to) for the exams just a couple weeks away! 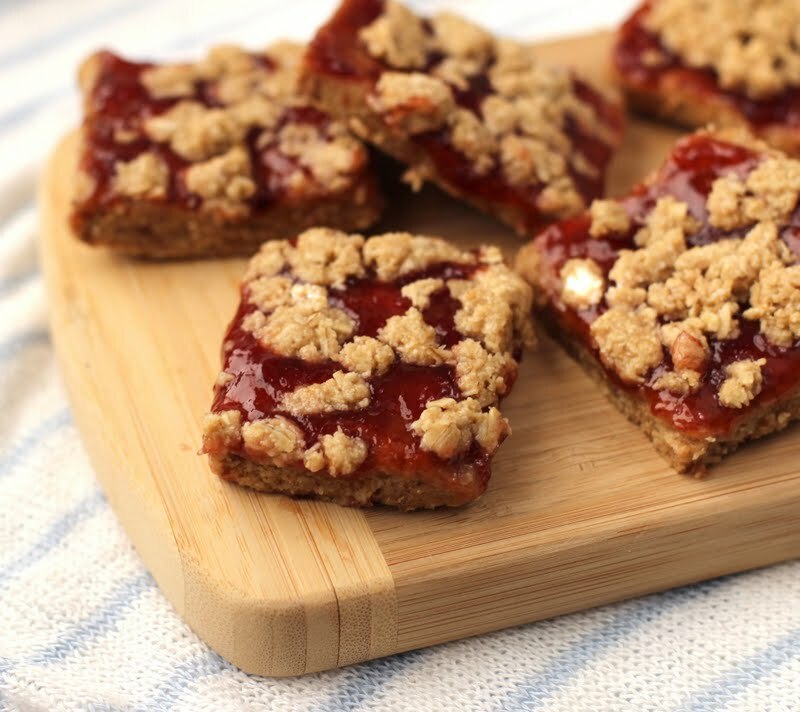 I gotta have some free time though, which I love, because I get to make sweet, delicious food :) I have always wanted to make bars like these (it was even on my Recipe Wishlist for quite some time), but every other recipe I found required baking. But, I need something new, something easy and fast! With those other recipes I found--along with having to turn on the oven--their crusts and crumble-toppings used sticks and sticks of butter. Just because it's being combined with oats and fruit jam, does not make it okay to pack on an unnecessary amount of unhealthy fats! I like these bars because they serve as the perfect snack: adequate fat and fiber, healthy and high-protein. In the twelve bars I made, each bar has 4g fat, 2g fiber and 7g protein! I ate three, hehe... but for something so sweet and tasty, I'm glad it's nutritionally balanced! 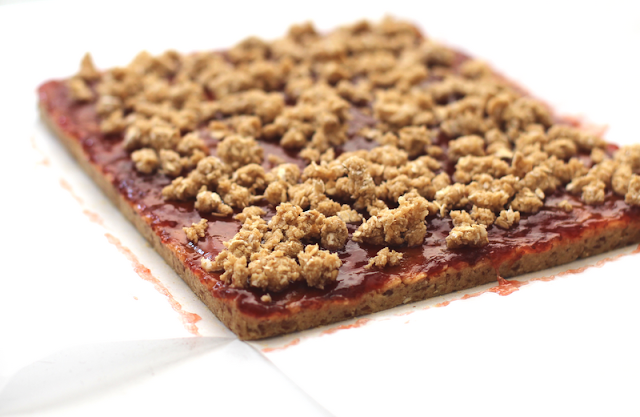 It doesn't make me feel guilty, as I would probably feel if I ate one jelly bar made in a bakery storefront! The crust smelled a little... boring... so I added 1/2 tsp of cinnamon, and BAM, it smelled awesome. 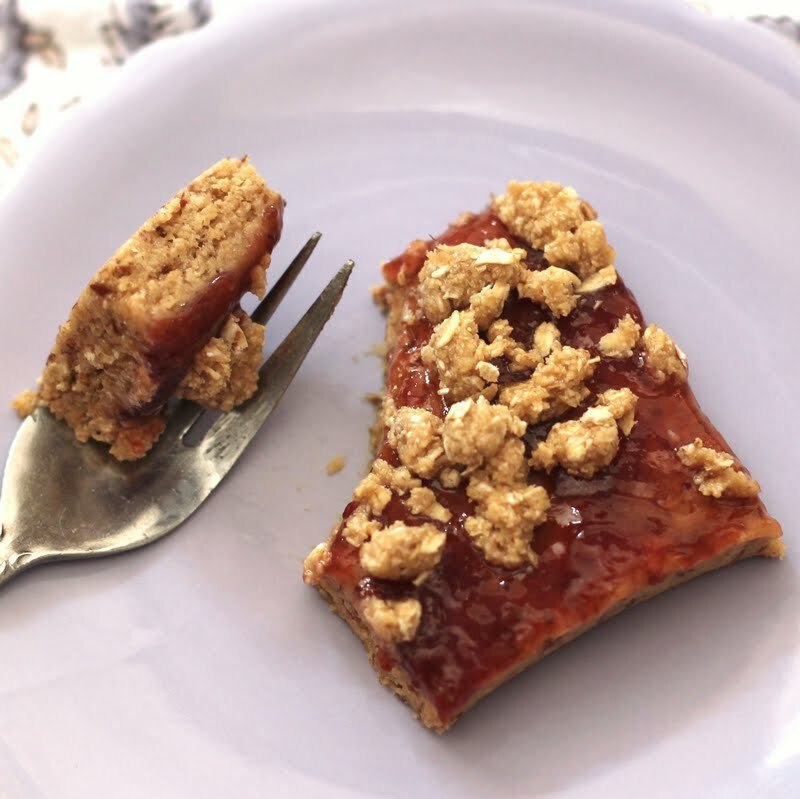 I flattened the mixture into a rectangle container, covered it with my strawberry filling (strawberry jam plus 1 tbs agave) and topped with a crumble made with 1/2 cup rolled oats, 1 tsp coconut oil and 1 tsp agave. I just blended the oats in my Magic Bullet until it became a flour, then blended again with the coconut oil and agave... it even turned out like a real crumble! After refrigerating and slicing up the bars, they felt more like bite-sized slices that should have been served to Alice in Wonderland... they were just too small! I was picturing bites the height of petit fours: little cubes of fruity, oaty goodness, similar to the size of these Maple Oat Petit Fours. They were as thin as can be. Unfortunately, the height of the bites wasn't the only thing wrong--who told me that cinnamon tasted good with fruit jam?! Um, no one. Reminder to self: don't mix cinnamon with strawberry jam. It tastes... strange... Thus, the second trial came along! I omitted the cinnamon in the crust and the agave from the strawberry layer (it was too liquidy). I doubled the crust recipe to add some height, and changed up the crumble recipe (but I don't know why, the crumble was perfectly fine the first time around!) I really like these bars. The crust was really moist and chewy and the strawberry jam just completed the dish. The crumble--I have to admit--is pretty unattractive, so I'll give you the crumble recipe from the first version. To store, cover with plastic wrap and refrigerate. I'm so glad I finally made these bars. I can finally cross it off my Recipe Wishlist! Congrats on your recipe success...these look delicious!! this recipe looks great! is it possible to use something else instead of stevia extract in the recipe, or to completely omit it? Anonymous, I put a star (*) next to the honey and had a note below the directions. To make vegan, use soy/hemp protein powder and agave. These are so yummy! I subbed 1 cup of millet for part of the rice cereal and still delicious. Thanks!